WASHINGTON, DC, May 19, 2015 (ENS) – Admitting guilt for a massive coal ash spill last year, three subsidiaries of Duke Energy, the largest utility in the United States, will pay a $68 million criminal fine and spend $34 million to benefit rivers and wetlands in North Carolina and Virginia. Four of the nine criminal charges relate to the massive coal ash spill from the Dan River steam station into the Dan River near Eden, North Carolina in February 2014. The other five violations were discovered as the scope of the investigation broadened based on allegations of historical violations at the companies’ other facilities. Coal ash is the waste material left after coal is burned to generate electricity. It contains arsenic, mercury, lead, and other toxic heavy metals. The $102 million penalty is the largest criminal fine in North Carolina’s federal courts, said Senior U.S. District Judge Malcolm Howard in accepting the agreements between the Duke subsidiaries and prosecutors. As part of their plea agreements, Duke Energy Business Services LLC, Duke Energy Carolinas LLC and Duke Energy Progress Inc. will provide $10 million to an authorized wetlands mitigation bank for the purchase of wetlands or riparian lands to offset the long-term environmental impacts of their coal ash basins. In addition, they will pay restitution to the federal, state and local governments that responded to the Dan River spill and be placed on a period of supervised probation for five years. Under their plea agreements, both Duke Energy Carolinas and Duke Energy Progress, must certify that they have reserved sufficient assets to meet legal obligations related to their coal ash impoundments in North Carolina, obligations estimated to be $3.4 billion. “The massive coal ash spill into North Carolina’s Dan River last year was a crime and it was the result of repeated failures by Duke Energy’s subsidiaries to exercise controls over coal ash facilities,” said Assistant Attorney General John Cruden of the Justice Department’s Environment and Natural Resources Division. “The terms of these three plea agreements will help prevent this kind of environmental disaster from reoccurring in North Carolina and throughout the United States by requiring Duke subsidiaries to follow a rigorous and independently verifiable program to ensure they comply with the law,” Cruden said. Duke’s subsidiaries operating 18 facilities in five states, including 14 in North Carolina, also will be required to develop and implement nationwide and statewide environmental compliance programs to be monitored by an independent court appointed monitor and be regularly and independently audited. Results of these audits will be made available to the public to ensure compliance with environmental laws and programs. The companies’ compliance will be overseen by a court-appointed monitor who will report findings to the court and the U.S. Probation Office as well as ensuring public access to the information. Some 108 million tons of coal ash are currently held in coal ash basins owned and operated by the defendants in North Carolina. On February 20, the three U.S. Attorney’s Offices in North Carolina filed separate criminal bills of information in their respective federal courts, alleging violations of the Clean Water Act at the following Duke facilities: the Dan River steam station in Rockingham County, the Cape Fear steam electric plant in Chatham County, the Asheville steam electric generating plant in Buncombe County, the H.F. Lee steam electric plant in Wayne County, and the Riverbend steam station in Gaston County. The companies must meet the obligations imposed under federal and state law to excavate and close coal ash impoundments at the Asheville, Dan River, Riverbend, and Sutton facilities. At the insistence of the United States, the holding company Duke Energy Corporation has guaranteed the payment of the monetary penalties and the performance of the nationwide and statewide environmental compliance plans. 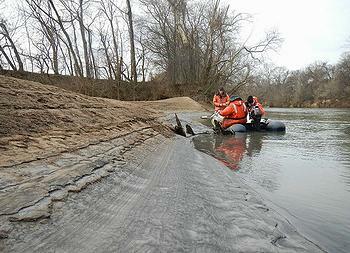 Duke subsidiaries also operate facilities with coal ash basins in South Carolina, Kentucky, Indiana and Ohio.